I’ve been away longer than I expected…We got back home this evening after a weeklong road trip through America’s hinterland. It was not a soft landing. We discovered that in our absence, another grisly murder had taken place in our home. Who knew hermit crabs were such thugs? We had already buried one, posthumously named Abel, before we left for our trip. This time, Cain, the murderer who had torn Abel limb from limb got his comeuppance. This time it was Cain’s legs that were strewn about the sand. When my son tried to move his lifeless body a whole demonic host of tiny winged insects flew out of its shell. It was like something out of a horror movie. My poor son is scarred for life. We did our own crime scene analysis. My son wouldn’t accept the fact that the last crab standing (the one I insisted he name after me) could have committed such a heinous crime. “But she would never do such a thing. She’s a goody two-shoes!” he insisted. but she’s a tough chick. We’re hoping she pulls through. And the moral of the story is: Don’t mess with Adrienne. She’ll get real crabby on your @$$. 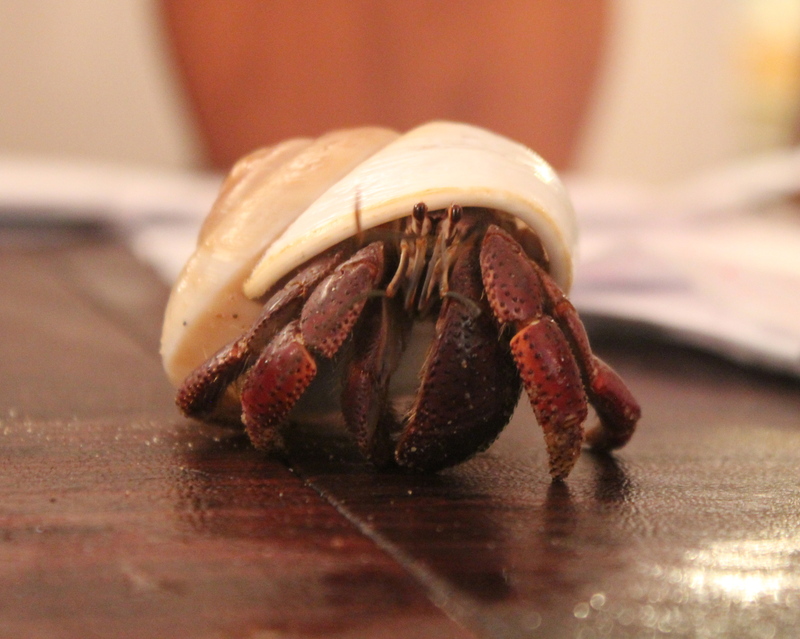 owonderful • This entry was posted in Family, Pets and tagged hermit crabs. Bookmark the permalink.